Here’s a quick blog devoted to everything that is going on in the bond markets right now. As you must have noticed, bond yields are collapsing around the globe. Again! More importantly, almost every day, some major benchmark rate is going negative. This week Europe’s most important interest rate, the German 10-year government bond yield, dived below zero. Needless to say, this has never happened before. In Europe, the risk-free rate is now officially negative. Things are even crazier in Germany’s neighbor, Switzerland. On Thursday, the Swiss 30-year government bond yield also turned negative. It’s only for the fact the Swiss have issued a 50-year maturity bond recently, that Switzerland’s yield curve is not completely below zero. But in Switzerland negative yields are just ‘normal.’ For me that’s difficult to comprehend. Why? Well, let’s put the Swiss bond yields into perspective. For example, the yield on that 50-year government bond is below the 1-month US Treasury yield. Let that sink in for a minute. Crazy, right? The ironic thing is that investors seem to be fleeing into government bonds at least partly because of (a decrease in) central bank credibility. Sure, the upcoming UK referendum also hits sentiment, especially since Brexit is gaining momentum. 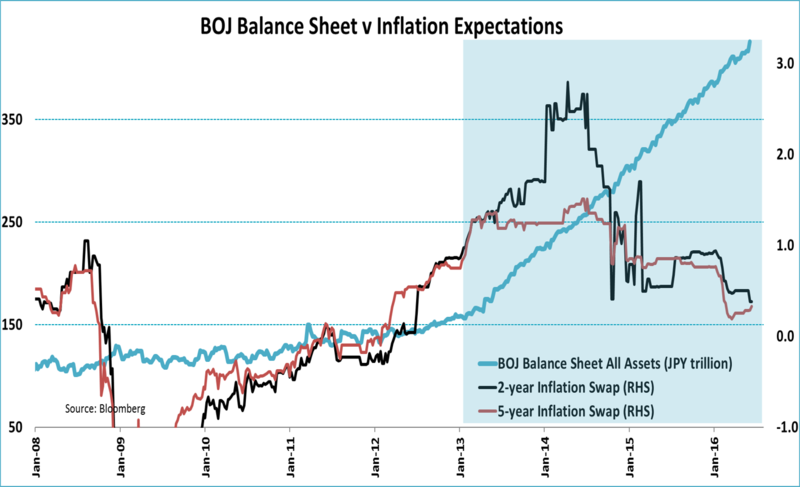 But the lack of clear results on QE, especially concerning the ECB and BoJ, raises serious doubts. As the chart below shows, the Bank of Japan already spent EUR 2 trillion in QE money without getting any inflation (expectations) in return. The same holds for the ECB, which spent EUR 1 trillion so far, but had to lower its inflation targets again, recently. The jitters concerning central bank policy is also causing historical return differentials between equities and bonds. Japan, again, being the most extreme example. 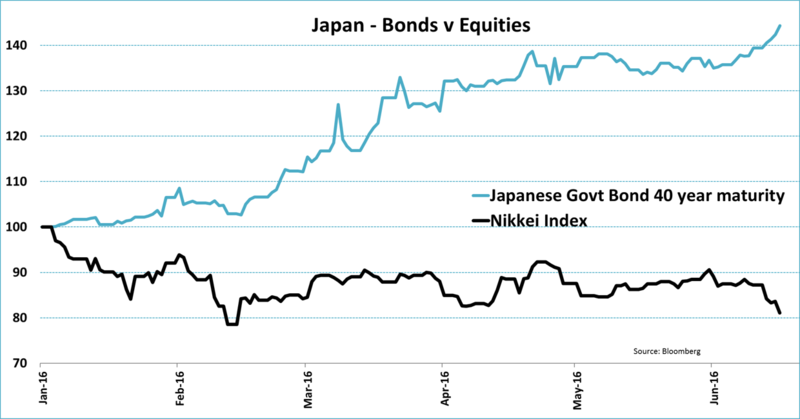 The 40-year government bond is up 44% so far this year, while the Nikkei Index is down 19%. That’s an incredible return gap of 63%, in less that six months. When it comes to bonds, we are in a state of superlatives right now. To demonstrate this take a look at the tweet below by Charlie Bilello (@MktOutperform). The table reveals that roughly half of all maturities of major economy government bonds ‘earns’ a negative yield. That’s pretty amazing, right? JPMorgan has translated this into a number. As of June 9th, a total of USD 8.3 trillion of outstanding government bonds are trading at an effective yield below zero. Since yields have gone down with the speed of light since then, this number is surely bigger now. Roughly one-third of the bonds in the JPMorgan GBI Broad Index, the developed markets government bond index, is trading with a negative yield. For some investors, though, government bonds are best avoided. And who can blame them? Technically the German 10-year government bond offers (below) zero yield and a certain amount of volatility. Government bonds have become ‘return-free, risky assets.’ Hence, investors look for other ways to be safe, gold being the obvious default option. 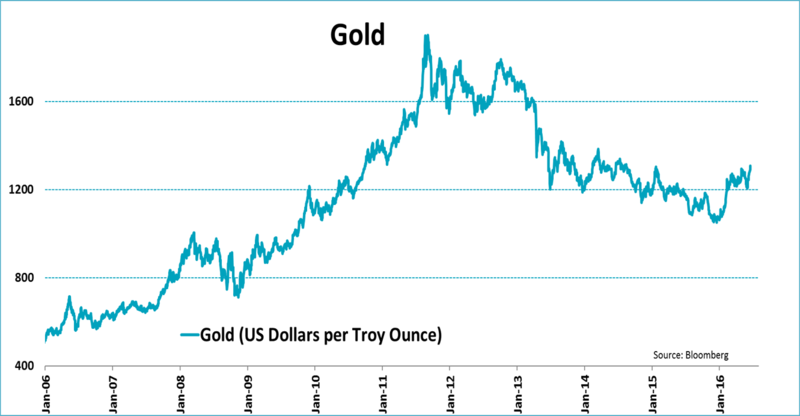 As the chart below shows, the price of gold is rising significantly, but it’s not yet spiking. For bitcoin this is surely the case. 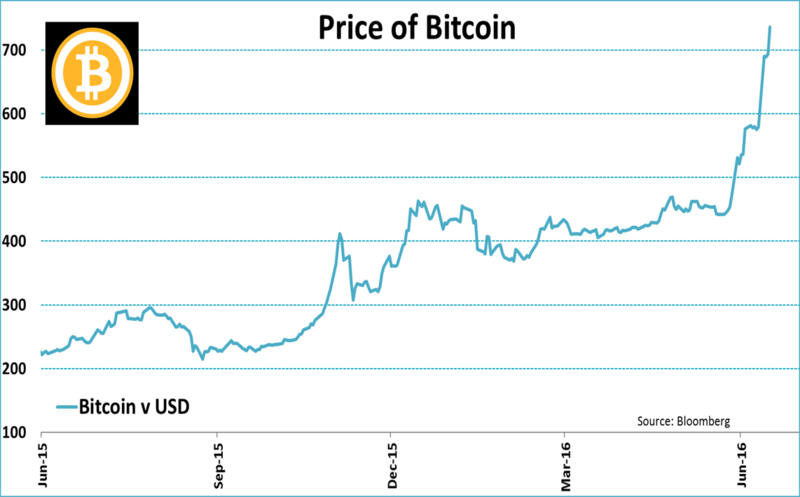 For the more adventurous investor, switching to bitcoin has really paid off in recent months. The price of bitcoin is up a massive 66% since mid-May and up 242%(!) since last August. I don’t know how bitcoin’s Sharpe ratio would hold up, bitcoin remains notoriously volatile, but from a return angle this looks amazing. Finally, as could be expected, negative yields really do change behavior. Nobody want to have to pay up to keep your money in the bank. Hence, in countries with abundant negative rates, people are getting their savings out of the bank. And that’s great news for manufacturers of money safes. Just look at the increase in demand for safes in Japan. To conclude: the world is drowning in negativity, which causes a flight to safes!